Hi Brett, Thanks. I did get about 4 points which will help me. Just FYI I will not be training with a company. 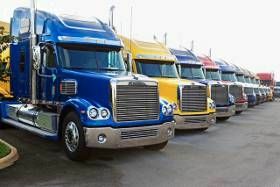 I am joining a private commercial trucking school May 5 just for the driving part coz I will have my permit with all endorsements except for Hazmat (which I will tackle later), School and Double/Triple (which I will not bother with). Keep them coming Redgator. You don't know how much this helps (speaking for myself, don't know about others). I certainly have picked a few of your pointers which I didn't know about. Thank you gal. You never know, you might train me next...lol. What is 'Apus'? Hi, just FYI, tomorrow on the 5pm eastern time news (ABC channel), they have a segment on "truckers and texting". Thought it might be of interest. I will ask for time off work early to come home and see what its all about. Have a good evening y'all. Very good idea Redgator. Just one question, how much would you reveal about your company on an open forum? Been struggling with some questions, but at times you are not sure if you will offend the recipient, or if they will find the questions abit unorthodox. Which brings me to another question. I start driving school May 5 but on May 3 there is an open day with recruiters from different companies, among them Prime, Stevens, Schneider, Western Express, Werner Enterprises. Obvious questions include pay, benefits, hiring locations, home time etc. What do I really want to know regarding company policies re driving??? One I will ask is about APUs. Anything else???? Daniel B., you couldn't have been more clearer!!!! Thanks. Thanks Starcar. I did apply thru TT Job Application and got a few replies though I got thoroughly confused. One or two, or is it three companies, both accepted and turned me down at the same time. What gives??? Some of them will be sending recruiters to an open house at the trucking school I will be attending. Hoping to get a job offer then. One question, maybe two. Will go thru training in NJ and obtain an NJ CDL hopefully before May is over. Am planning on relocating to Indianapolis where my daughter lives immediately after. When I start applying should I request that I be considered for employment in IN? Should I expect any complications? How would you go about it? Hi, also been wondering about those, after watching a lady trucker on you tube claimed an O/O tried to siphon gas from her truck. Check out www.windshieldcam.com. Don't know if anyone else has used it or how good a product it is. Anyone??? I know people who like putting others down suffer from a bad case of inferiority complex....Would have given anything to see the look on the face of the man who said you didn't have what it took to become a driver. Thanks Anchorman. Its a good thing to encourage others to join. I know I have learnt lots from the Q/A and I am still learning new stuff. Just don't forget some of us "GIRLS" are truckers, newbie truckers and wannabe truckers - (referring to "Quit being a girl and sign up already".) Only the ratio is different. Thx for the info DoubleCutter. While I dont drink beer I must admit that I tend to put on weight every winter, and this winter was especially long and baaaad. So it was work then home, period. But since my weight might become an issue when applying for jobs (and my health in general), I will hit the gym and the park....again!! Thanks to all the contributors on the informative subject regarding sleep apnea. During a visit to my daughter late last year, she told me that I stopped breathing during my sleep. Guess this means I might be asleep apnea sufferer. So, will hit the gym starting tomorrow and hope to reduce the chances of it becoming a real problem. Congrats. Very happy for you. You can do anything within your power, once you set your mind to do it. "Anything that is not actually impossible can be done, if one really sets ones mind to do it and is determined that it shall be done". "Anything that is not actually impossible can be done, if one really sets ones mind to do it and is determined that it shall be done"
Just read 10 minutes ago that the FedEx driver might have swerved to avoid hitting a car.